Vice President Yemi Osinbajo has announced plans by the Federal Government to expand the broadband coverage of the country through the licensing of private broadband providers. According to him, technology has put great powers in our hands as individuals but more importantly as co-creators and collaborators to positively and dramatically change the course of human existence. Osinbajo noted that with technology , the country could solve many problems confronting the people. He said that in addition, the country could connect people, grow businesses, influence good governance, and create better lives and a better country for the citizens and for the future. He said that the country was in many senses at an exciting moment in history because of what the young people were doing in innovation and their sheer energy and talent. Accordingly, the vice president the future the country is looking well and it has already arrived, is bound to be an exciting one for the youth and adults. He said that the government would be with the youth in every step of the journey. 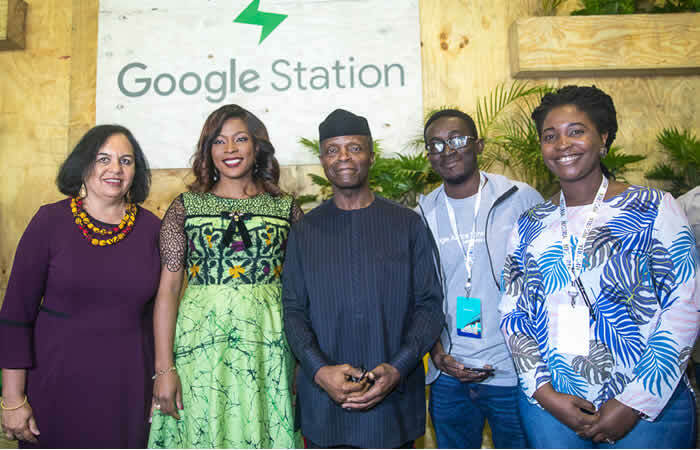 Osinbajo thanked Google for democratising the country’s digital space, urging that such innovations should be extended to many of the nation’s markets where a large number of people ply their trade. He observed that through Artificial Intelligence, the country was guaranteed more food and better healthcare. He said that every step made to make technology available would lead to a quantum leap in the African development story and a major contribution to global stability and growth. The Country Director of Google, Juliet Ehimuan-Chiazor, earlier said that the African digital story was evolving and the organisation planned to keep building products and programmes to accelerate growth in Nigeria and Africa. She recalled that in 2017, the company had brought together Google’s global leadership with over 200 key stakeholders in the industry. She said that the organisation remained committed to developing the digital ecosystem and making its products more useful for Africans. “Most of Africa’s biggest challenges may not be solved by methods of the past; with machine learning and artificial intelligence these problems can be solved in a radically different way both faster and more cost effectively. “For example, today with a smart phone and a camera and existing apps, it is possible to detect and prevent diseases, predict severe weather conditions, like droughts, and also address financial inclusion for the un-banked.’’ she said. The Google chief said that the country would continue to seek digital growth of Nigeria and Africa as Nigeria currently had over 45 million mobile internet users and future growth would be driven by smart phones currently growing at 14 per cent annually. She recalled that Google had committed to training five million Africans as well as to train the next developers of Africans and giving them Google certification. Ehimuan-Chiazor said that entrepreneurs in Africa would create the jobs of the future, adding that the company was willing to through its Launch-pad Accelerator Africa give more than three million dollars equity free support to more than 60 early stage start-ups in the continent. “Since the launch earlier this year, 12 start-ups have graduated from the programme, working across a range of industry. “They have created 132 jobs and raised over N7m in funding and their products are used by approximately 4.5 million users,’’ she noted. She also recalled the $20m pledged to support non-profits in their jobs. In a related development, the Vice President declared open the Co-working Conference 2018 of innovators in Lagos. At the conference, he stressed the need for collaboration and partnerships among entrepreneurs to boost productivity and economic growth.